To pinpoint the leaves of the tree must be very observant. It's pretty hard to do if you've never seen how they grow the trees themselves, as appear, evolve and fall off they are so different leaves. Since the first days of spring, more walk in parks and forest areas, watch for emerging tender leaves, try to visually remember and the trees themselves, and the shape of the leaves. If necessary, Refine their names. Use the camera. Identify your images with illustrations in encyclopedias, with photographs posted on websites about trees. So you can remember the names of the trees and their leaves. Despite the fact that spring and summer the leaves are all green, you can identify them easily. The ash foliage bright green, maple – dark green, but in aspen she sparkles. The leaves of birch, alder, poplar look like patent leather. The fact that the resin covering their tender shoots, protecting it from weather changes and impedes evaporation. May the air of these tree resins is particularly fragrant. Watch the leaves in the summer, when most of them had already acquired its final shape. Their shape, edges, volosistoj and other external characteristics are extremely important when identifying a tree. Describe in detail all your observations. Later this will help you readily identify the name of the tree, just holding the sheet in his hand. Be sure to pay sufficient attention to the fall walks. Parks becomes so beautiful from the colorful decoration! 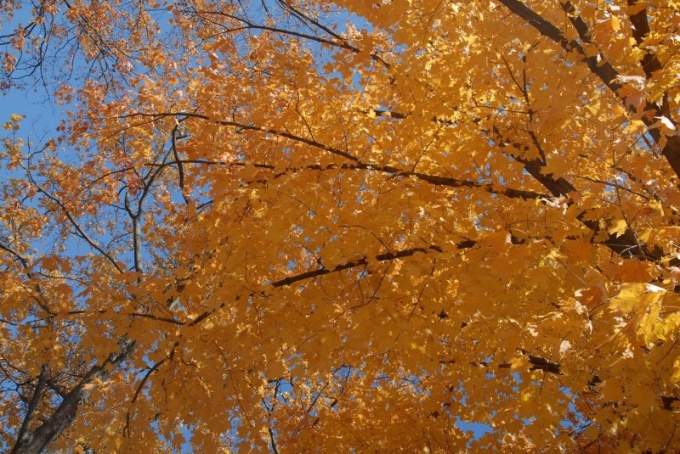 In temperate and Northern latitudes most of the trees shed their leaves. At this time you can take a closer look at each piece and determine which tree it belongs to, based on observation and knowledge. Learn to distinguish the leaves of poplar and aspen. At poplar the leaf of the extended egg-shaped with serrated edges. At aspen the same whitish-green round leaves of small size, the edge has a wavy shape. Find the differences between the leaves of birch and grey alder. At last they round shape with a sharp tip, and the birch – rounded, with a pointed end and serrated edge. Among the autumn foliage is easy to distinguish the oval of oak leaves, reminiscent of the crown of this sacred tree, or horse chestnut, after which the tree remains a scar, like a horseshoe. Of Linden leaves resemble the shape of a heart. Their length not more than 4-8 cm, and scalloped. Collect herbarium. For a long time, you will always look and clarified which tree belongs to a fallen leaf. Use introduced apps for phones and other devices for fastening of the received skills.